Like most good friends, we both have great things in common, but also admire our differences in the careers we have made for ourselves … our sense of styles … our diverse perspectives … our varying quirkiness and personalities … and even our assortment of taste buds! This is what has inspired the things you can find on the blog: food and drink recipes, DIY projects, home decor ideas, travel chronicles and tips, lifestyle inspirations, and career advice and tidings. When is To Be Simply Happy’s birthday, you ask? May 25, 2016! Yep, that’s right – TBSH is a young one! Who are the ladies, Bridgette and Angela, you speak of? 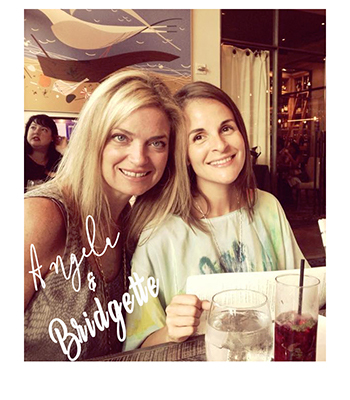 Check us out on our individual pages: Bridgette – Angela. We understand you’re curious! Does To Be Simply Happy go by anything else – my goodness that is a long name! Yes, you can call us TBSH … we already are! What are you hoping to achieve with TBSH? Great question – we can see we’ve got some smart cookies here. We are all on a quest to embrace the great person we are today while nurturing ourselves to a better person we aim to be tomorrow. We are sincerely wanting To Be Simply Happy to be a trusted source you can let your hair down … learn something new … be inspired … laugh with your friends … feel safe in self-reflection … engage and share in your own ideas and inspirations … and simply be happy and smile! We hope you reach out and get engaged in our blog and over social media … and until you do – happy reading! Now … go out there and live a “simply happy” life!